Travel Journal to Central Training School of Gyeonggi-do Taekwondo Association, World Taekwondo Taedoo Union (WTTU) in China. 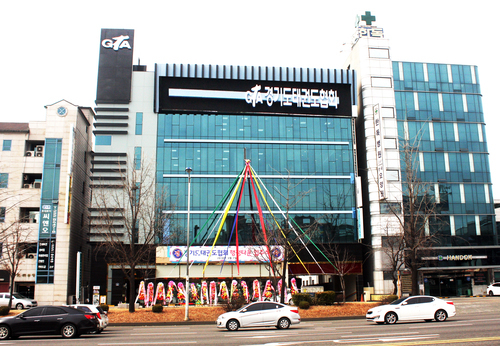 In December 20, Gyeonggi-do Taekwondo Association (President : GM Kim Kyung-deuk) opened Central Training School in the 3rd floor of the association building after one month of remodeling work. 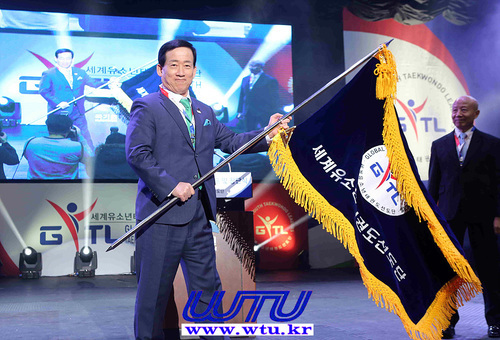 For the fist training, 50 members of the largest Chinese Taekwondo Association, World Taekwondo Taedoo Union (WTTU) visited the Central Training School and got training from 09:00 AM to 12:30 PM on December 20. 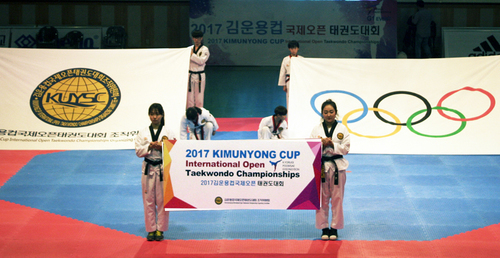 On the day, the training continued in the order of actual Taekwondo, Taegomdo, self-defense martial art, fitness exercise, poomsae, and sparring. 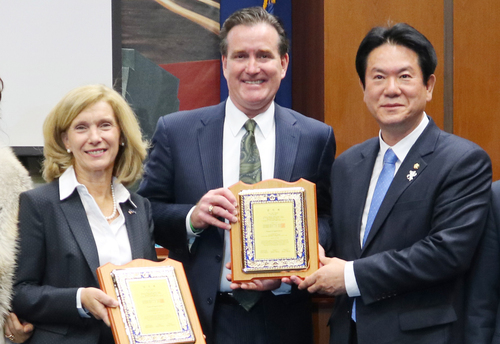 President Kim of Gyeonggi-do Taekwondo Association and other participants were greatly impressed by the passionate attitude of trainee (director, instructors) from China. What was surprising with Central Training School was that the school had wide open space (140 pyeong) and that the school was really clean. When I looked at the door of fitting room, the door was about 1m 20cm high. Thinking that door was too low, I asked president Kim about the door. Then, president Kim smiled and answered that modesty is the basis martial arts and that he designed the ‘Door of Modesty’ to have trainee to learn bending waist and head when changing clothing. I also found a log with 20cm diameter and 12m height and the log was coiled with ropes. I was told that the log was for training the foot blade and fore sole. Inside the building, there were two pillars. The front pillar was for training the fist and the other pillar was for training the hand blade. I also found a thick square wooden box. The wooden box was about 50cm deep and 3/2 of the box was filled up with beans. The wooden box was arranged for training fingertip. Then, I saw caldron lid and fire pot. The caldron was turned to hold sands. The caldron lid was called ‘Chul-Sa-Jang’ and it was for training the hand blade skin by lightly hitting the hot sand repeatedly. As I saw earthen pot and tree root, I asked about them. Then, I was told that the root is the dried lycium root used in the herbal medicine shop. When I asked about the effects of lycium, they told me that it is for reliving muscle pain and for anti-inflammatory effect. After training the hand blade or going through ‘Chul-Sa-Jang’, people can put their hands inside hot water boiled with lyceum and salt to relax the muscle. I also found balance beam made of log and I was told that the balance beam is for standing on bare foot and training the weight shift. Those facilities show how Central Training School of Gyeonggi-do Taekwondo Association is well-equipped for the training. ‘Actual Taekwondo’ uses hands more than foot and it is used for taking over the opponent in an instant. The Chinese trainees were impressed by the new skills. 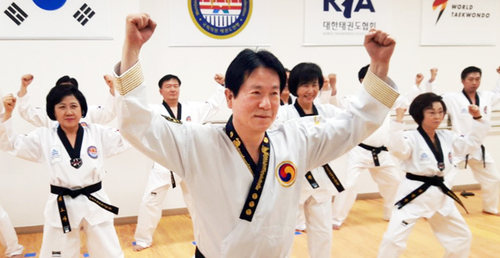 In the next session, Gyeonggi-do Taekwondo Association demonstrated Taegomdo. Taegomdo is a skill combining Taekwondo and swordsmanship. On that they, performers showed Taegeuk Chapter 1 with swords in both hands. The demonstration drew much attention and children and adolescents would like Taegomdo a lot. In the 3rd session of ‘Fitness Dance’ Gyeonggi-do Taekwondo Association showed steps and rhythm used for making Taekwon Exercise. In the 4th session of ‘Self-Defense Martial Art’, the performers showed the skills of controlling the attacking opponent instantly by using hands and legs. The 5th session was the ‘Traditional Poomsae’ session. Poomsae expressed with waist power and breathing was quite different from modern Poomsae. 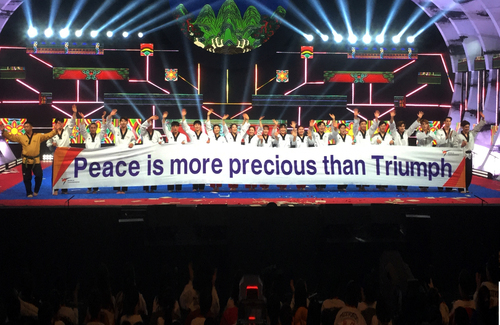 In the 6th session of ‘Sparring’, Gyeonggi-do Taekwondo Association demonstrated and explained ‘Three Step Sparing’ and ‘One Step Sparring’ of Promise Sparring which is not widely used currently. Everyone was satisfied with the lecture on how to block and avoid opponent’s attack and how to return the attack. 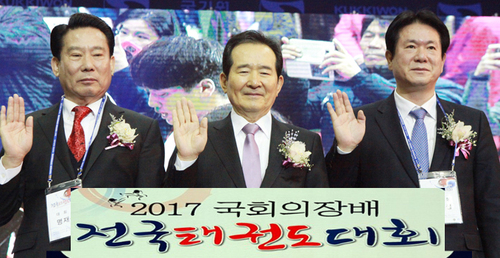 When president Kim was asked about the direction of Gyeonggi-do Taekwondo Association, he said “Although Taekwondo was successfully globalized, traditional Taekwondo are disappearing. 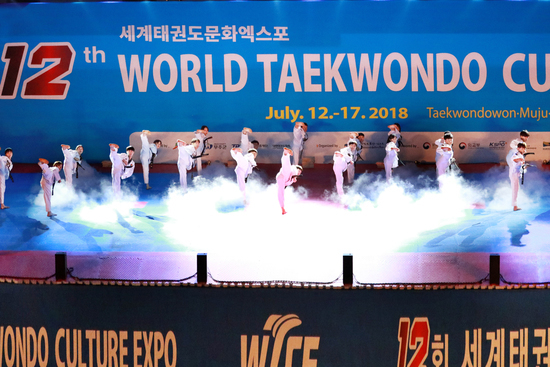 Like many other martial arts sports disappearing in history, Taekwondo might disappear someday” and that “Currently, Taekwondo school is becoming a place for a play. 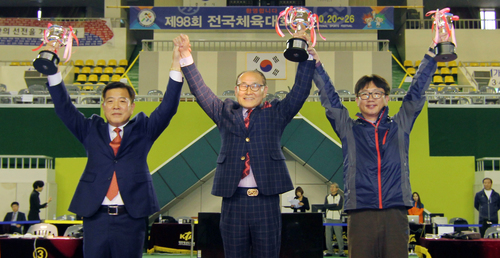 In such situation, we need to combine sound spirit, and internal and external training of the traditional Taekwondo to return the current Taekwondo school to the space for training the mind and body. Also, Taekwondo school should play leading role in maturation and should prevent harmful effects from simple repeated training at Taekwondo school. 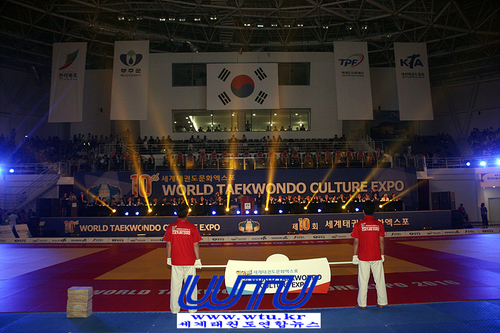 Also, Taekwondo school should seek various paradigms and motivate trainee to overcome the difficulty in operation. 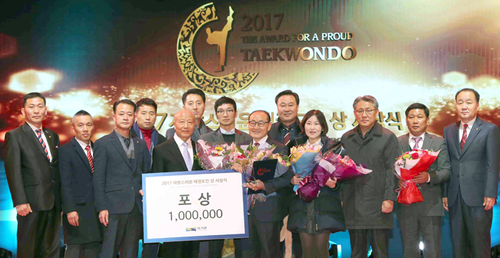 Gyeonggi-do Taekwondo Association also plans to train each session for 100 hours (about one and a half month), issue various license, and cultivate instructors by providing Taekwondo courses such as ‘Silver Instructor Education’ and ‘Herbal Taekwondo Education’ starting from January 2019. 20일 대한민국 태권도의 중심을 자부하는 경기도태권도협회(회장, 김경덕, 이하 경태협) 중앙도장 연수원이 협회 건물3층에 한 달여간의 리모델링을 마치고 문을 열었다. 20일 첫 연수는 중국 태권도 단체 중 가장 규모가 큰 태두태권도연맹(회장 황해성 32세, 산하도장 300개, 본부 심양)지도자 회원 50여명이 이날 09:00시부터 12시30분까지 전통태권도 복원을 추구하는 경태협 연수원에서 교육을 이수했다. 이날 교육은 실전태권도, 태검도, 실전호신술, 휘트니스 체조, 품새, 겨루기, 순으로 이어 졌으며 중국 교육생(관장, 사범)들은 너무나 열띤 수업태도에 이를 지켜본 경기도 태권도 협회 김회장을 비롯한 관계자들에게 큰 감명을 주었다. 이날 연수원 면모를 살펴보면 우선 140평의 넓은 공간에 놀랐고 이미 사라지고 없는 이설물들이 자리 잡고 있어 또 한 번 놀랐다. 또 한 켠에는 지름 20cm쯤 되어 보이는 길이 12m정도의 새끼를 감은통나무가 있었다. 발날 및 앞축 단련대란다. 건물 안에 두 기둥이 있는데 앞축 기둥에는 4방향으로 주먹 단련대 다른 한 켠에 기둥에는 손날 단련대가 부착되어 있었다. 두툼한 사각 나무통도 보였는데 깊이가 50cm쯤 보였으며 그 안에 3/2쯤 콩이 담겨져 있었다. 손끝(관수)단련대란 것이었다. 또 한 켠에는 솥뚜껑과 화덕이 보였는데 이는 솥뚜껑을 뒤집어놓고 모래가 담겨져 있었다. 철사장이라고 해서 모래를 덮펴서 손날을 계속 가볍게 툭툭 치면서 손날피부를 단련 해주는 장치란다. 그 옆에는 약탕관과 무슨 나무뿌리가 같이 있길래 질문을 던졌더니 약초 뿌리는 한약방에서는 지골피라고 불리는 구기자 뿌리 말린 것 이란다 그 효능을 물었더니 근육통 과 소염재로 쓰여지는 것으로서 손날 단련이나 철사장 후 지골피와 소금을 타서 뜨겁게 끓인 후 손을 담거 근육을 풀어주는 효과를 얻는 수 있단다. 4교시는 실전호신술 로 손과 발을 적절히 이용해 단숨에 공격해 오는 상대방을 제압하는 기술에 너무나 신기해했다. 6교시는 겨루기 시간으로 현재는 도외시 되고 있는 약속겨루기 형태를 세번겨루기, 한번겨루기 틀에 대해 시연과 함께 설명이 뒤따랐으며 상대선수가 공격해 들어 왔을 때 어떻게 막고 어떻게 피하며 어떻게 받아 차야 하는지를 전문성이 배어나는 강의에 모두가 너무나 흡족해 했다. 김회장은 향후 경태협 연수원의 지향하는 방향성에 대한 질문에는 태권도가 스포츠 태권도로서 세계화에는 성공했지만 원천적 전통 무도태권도가 많이 사장되어 가고 있고 또한 수많은 대중적 무도 스포츠가 역사속으로 사라져 가듯이 태권도 도 그러지 말라는 법이 있겠냐? 면서 전통태권도 속에 내재되어 있는 올바른 정신에 바탕을 둔 심도와 내외공에 바탕을 둔 체도를 합일시켜 태권도의 기본원리를 수련케 함으로 놀이 문화로 가는 유치원화 한 현 태권도장 환경을 심신단련 수련장으로 환원 시키면서 성인화의 길라잡이로서의 선도적 역할을 담당하고 태권도장의 단순한 반복 수련에서 오는 폐해를 방지하고 다양한 패러다임을 추구하여 수련자들로 하여금 동기유발을 상승시켜 어려운 일선도장 운영난의 타개책으로도 긴요하게 쓰여 질것라고 역설했다. 이밖에도 실버지도자교육, 한방태권도교육 등 다양한 태권도지도 과목을 가지고 내년 1월부터는 기수별 100시간 정도(약 1개월 반)교육 후 각종 라이센스 발급과 함께 지도자를 양성할 계획을 가지고 있었다.